Beba is a wealthy divorced woman who is being gravely affected by the Argentine economy and therefore doesn't have enough money to even pay her maid. 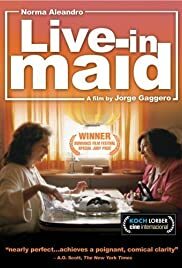 Dora, the maid, has been living with the family for thirty years and is torn between not wanting to leave Beba alone and needing a steady income. The pace of the movie is kind of slow as the plot is very simple and does not go beyond the regularities of the lives of the two main characters. However, the simplicity and regularity of the story is quite enjoyable as we are able to truly enter the lives of two very different women and identify the many differences between them. The director Jorge Gaggero shows us the way in which people's roles in a relationship can certainly change over time. Although Beba has been in charge of Dora for so long because of her economic status, when her status changes, Beba has nothing to hold over her and soon realizes how much she needs Dora. The movie explores economic class differences in Argentina through a very personal lens which in turn results in a very interesting and meaningful story.